Bucharest is known for its exciting nightlife, eclectic architecture and sociable people. But you can add great shopping experiences to this list of pros, because this capital city has been seeing, in the last years, an increase in new malls with great concepts and service. In 2018, Băneasa shopping city is celebrating ten years since its grand opening, and still is one of the most popular Bucharest malls. Located in the Northern part of the city, in the Băneasa neighbourhood area on the way to the Henri Coandă International Airport, and in the close proximity of Băneasa International Airport, this Bucharest mall offers the ultimate premium shopping experience through its unique tenant mix of over 280 stores. It is accessible by car or public transport, and it only takes about 20-30 minutes to get to Băneasa Shopping city from the center of Bucharest, depending on the time of day. Avoid going there during the morning or evening rush hour, as traffic in the Băneasa area can slow you down. The best things about malls in general is the fact that you can spend a whole day there - and have some fun! Besides shopping, at Băneasa shopping city - or most of the Bucharest malls for that matter - you can be entertained at the movies. Grand Cinema Digiplex is a chain of cinema theaters with ultra modern technology, offering audiences an incredible viewing experience at Băneasa shopping city. The Grand Ultra theatre of the Grand Cinema Digiplex has the biggest cinema screen in Romania (270 square meters, to be exact), a revolutionary sound system Dolby Atmos and the newest international film premieres. 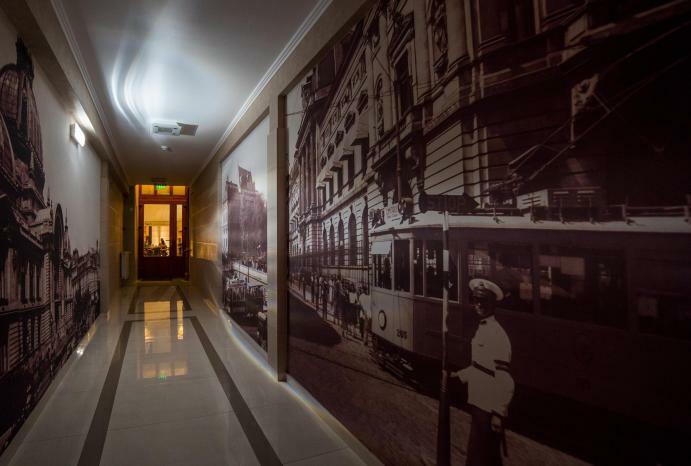 The “Grand” concept is not only found in Băneasa shopping city, but at Concorde Old Bucharest hotel too - this modern boutique hotel, located in the Old City area of Bucharest, welcomes you with excellent accommodation. The Grand Deluxe rooms, with enough space for a Queen or King sized bed, a smart TV with multimedia apps , high quality furniture with a chic design and, of course, free Wi-Fi, will make you feel right at home. 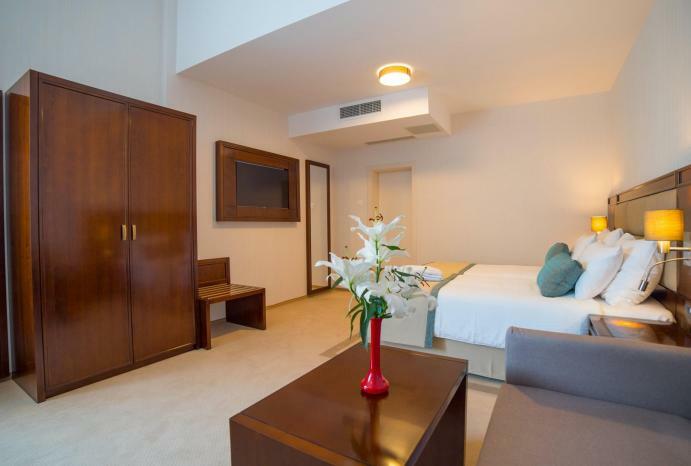 Book this room, and enjoy a Grand stay in Bucharest! Since Băneasa shopping city is so conveniently situated on the way to the airport, it is the perfect place to make one last stop before leaving the city. Your last day in Bucharest could be easily spent at Băneasa Shopping city, going through luxury stores such as Chanel for cosmetics, Cellini for watches and jewelry, Furla, Boggi, Chopard, Brooks Brothers etc as this Bucharest mall has primarily luxury and famous premium international brands. You can even find the latest fashion in designer stores such as Michael Kors, Tommy Hilfiger and many others. If you did not have enough time to stop and have a delicious meal or a refreshing drink in the Old City before leaving, you can visit Băneasa shopping city’s food court and enjoy anything from fast food to gourmet. World food like Greek or Italian will satisfy your appetite in an effervescent atmosphere. French desserts and couture cakes will sweeten you up before your departure. 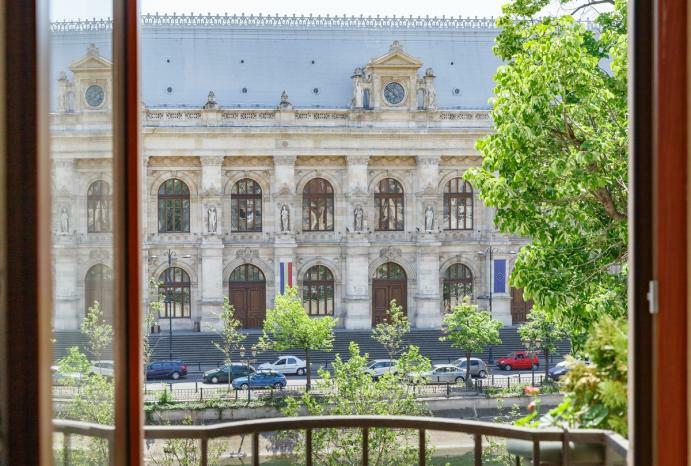 There are many reasons to come to Bucharest, and shopping in Bucharest at best prices is a strong reason to plan a trip here. You are most welcome to stay at Concorde Old Bucharest hotel, where you will find delight and relaxation, plus 4 star services and facilities. Check out our rooms and book now!